Har Hevron regional head promises that after Dafna Meir's murder 'we will only grow'; Rivlin calls to offer condolences. Har Hevron regional council head Yochai Damari responded on Sunday night to the murder in Otniel, in which Dafna Meir, a 39-year-old mother of six, was stabbed to death by an Arab terrorist at the entrance to her home. "This evening a resident of the town of Otniel was murdered, when a terrorist pounced on her at the entrance to her house," said Damari. "She fearlessly defended her three children who were in the home at the time." The regional head said, "Otniel has known this type of incident in the past. I say clearly and unequivocally: from this despicable murder we will only grow. Those who thought we would run, fear and not be here as a result of this murder - will receive the exact opposite." "We will double our strength. 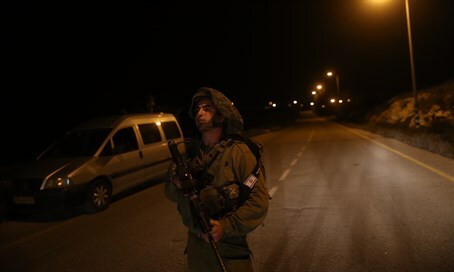 That is the appropriate Zionist response to terror attacks," said Damari. President Reuven Rivlin spoke with Damari soon after the attack, offering his support and asking that Damari convey his concern and sympathies to the residents. "This is a horrific tragedy, and I am with you with all of my heart. This is shocking and terrible. At this time of grief, disbelief, and pain, I am sure you are focused on doing all that is needed in order to help the family and all the residents of the community," said Rivlin. Damari thanked the president for his support, and said, "I greatly appreciate your calling at this difficult time and I will pass on your words to the family. I have faith and trust that the security services will find the terrorist sooner or later, and that they are doing everything possible in order to return a sense of security to the community as swiftly as possible."